Yesterday was a tragic anniversary for the national pastime, baseball. Forty years ago, Ron Blomberg of the Yankees stepped to the plate as the first designated hitter in Major League Baseball. American League baseball has been inferior ever since. than two outs? Do you pinch-hit? Do you do a double switch in the lineup, also replacing another position player, so that the pitcher's position in the order doesn't come up until later? Everyone uses the opportunity of the pitcher, usually by far the weakest hitter in the lineup, hitting to second guess the manager's move. 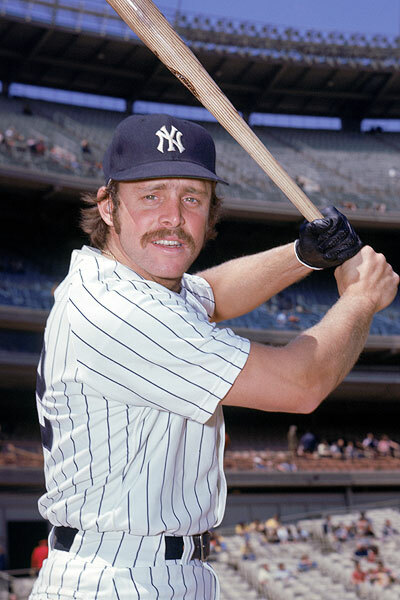 In 1973, the American League decided to remove this strategic decision by adopting the designated hitter, a permanent pinch-hitter for the pitcher's spot in the order. That player would never have to take the field but could bat just like the rest of the players who did. The American League adopted the rule because it wanted to increase scoring by having adding another good hitter in the lineup. Another reason was because of a desire to keep really good players in the game longer. The ability to hit a baseball for some reason usually lasts longer than the ability to field a position, although many DH's were not good fielders in the first place. There are a lot of problems with the DH rule, besides the loss of a key strategic decision that enticed fans to second-guess managers. Another is that it hurt development of younger players. The DH quickly filtered down to not only minor league, but also to college, high school, junior legion and other amateur baseball leagues. In those arenas, the DH is often used for a regular position player who, while a good defensive player, needs at-bats to become a better hitter. Another consideration. In the American League, the pitcher knows he will never have to face being hit with a 90 mph fastball for his intentionally hitting an opposing team's player. In the National League, a pitcher always knows that he too will eventually be at the plate and could face repercussions. How much offense does the DH add to the game? Looking over the statistics from 2000 through 2012, it appears that on average American League teams score about 50 more runs per season than National League teams. With a 162 game season, that's a paltry 1/3 of a run a game per team. It should be pointed out that most AL teams are no longer using the DH as it was originally intended. Now they use it as a way to rotate bench hitters in the DH slot, to give those players at bats to keep them sharp. Finally, people forget that in the 1984, then MLB Commissioner Peter Ueberroth announced that he was going to poll MLB fans on the DH and if they liked it, he would have the National League would adopt and if they didn't the American League would get rid of it. If there was more than 60% support in either direction, he would fight to get unification. Whatever the survey numbers were, Commissioner 40 percent of fans think neither league should have the rule, while 29 percent say the National League should adopt it and 30 percent said things should stay as they are. Apparently it was not a "yes" or "no" DH question. I firmly believe most MLB fans would vote "no" to the DH. Certainly all the National League fans would and I believe some American League fans would too given what the DH takes away from the game in terms of strategy. It's a bad anniversary. Unfortunately I think the DH here is for many years to come. Baseball is boring and the DH makes it almost unwatchable.